Researchers don't spend all of their time in laboratories. They often find themselves in the field, collecting data or samples for later analysis. And that means that scientists are more likely to have adventures than many people with more mundane jobs. Stephanie Schuttler is a good example. Schuttler is a postdoctoral researcher at North Carolina State University and the North Carolina Museum of Natural Sciences. She is part of eMammal, a citizen science project that uses camera traps to improve our understanding of the diversity and distribution of mammals, and is working to integrate eMammal into middle school classrooms as part of the North Carolina State University-led Students Discover program. But in 2008 she was a Ph.D. student at the University of Missouri, doing research on forest elephants at a remote research station in Gabon's Lopé National Park. Her research focused on improving our understanding of the social structure of these forest elephants and how they interacted with each other. But one night the elephants apparently decided that they wanted to know more about the researchers. 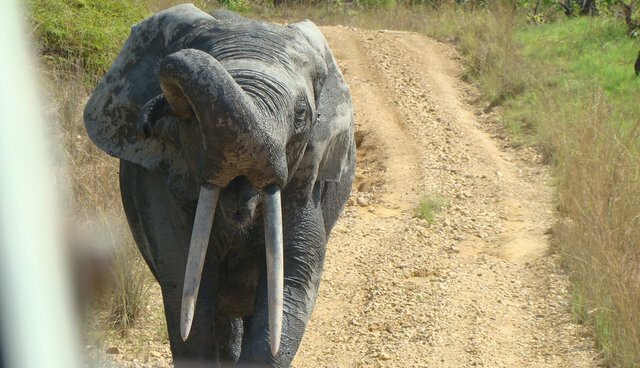 "For the most part, these elephants are skittish around humans," Schuttler says. "But at night, they would often come out near our research camp, right next to our rooms – after people had gone to bed – to forage the mowed lawn and among fruit trees near the building where we slept." The researchers slept in a long cabin that was divided into one-person rooms, each of which opened onto a porch that ran the length of the building, with a communal bathroom at the end of the building. "One night, I was woken up by the sound of three or four elephants snapping the branches off of the fruit trees," Schuttler says. "They were unusually noisy. I tried to go back to sleep, but the elephants began circling the building, and I could tell from the sound of bending metal that they were breaking parts of the bathroom." This was sufficiently unusual for Schuttler to be a little alarmed, but eventually the elephants moved off to other parts of the camp, where she could hear them going through the trash and breaking a window. An hour or two later, the elephants came back. One began tentatively pushing on Schuttler's door, while another began groping along the wall and actually pushed its trunk through a window on the other side of the room. "At this point, I was scared, and had moved to the middle of the room," says Schuttler. And when the elephant by the door moved away, she made a break for it and ran to the room of a nearby colleague, who was also alarmed. The two researchers lit a candle and started talking about what they should do next, if anything. "I'm not sure if it was the candle or the fact that we were talking, but the elephants really didn't like it," Schuttler says. "They did a ‘rumble' – a very low-frequency, growling sound – and that scared us. We blew out the candle and went quiet. Not long after that, they left." The next morning they found planks knocked out in Schuttler's room and pipes pulled out of the bathroom walls. "It was the only time something like that had happened in the 25-year history of the park," Schuttler says. "And it hasn't happened since, that I know of. I spent months doing field work there in 2008 and 2010, but that night was an experience I'll never forget."